Entering now the fourth year of its journey into the world, here marks a summary of my composition project, Aberfan, for those new to this blog or to the tragic event itself. My mother wrote a folk song in the wake of the disaster, that I heard as a child. Using excerpts of melody and lyric from her song, as well as portions of hymns — one the children would have sung at morning assembly on the day of the disaster and another sung at the mass funeral less than one week later — Aberfan splices 31 musical Sequences of Rain, Sunrise, Interlude, Hymn, Rock, Rubble and Field with their Alterations. Piano parts are specific; percussion, and to some extent, voice, are improvisatory. Steel shovels, picks and hatchets, spades, breaking glass, bare hands — these are the tools of rescue. Envisioned at the crossroads of modern music, experimental media, environmental crime and the psychology of trauma, Aberfan will be presented alongside black and white photographs taken by Life photojournalist IC Rapoport, who went to Aberfan to photograph the “psychic mess”. Investigating how art, together with technology, can be used for experiential transformation, Aberfan addresses the visceral, personal experiences of the disaster, while recognizing its universal relevance as an almost-forgotten humanitarian crime against a future generation. Merging the music of Aberfan and photos of this particular disaster’s aftermath lays bare the great cost of ignoring the habituated, presumptive violence in our human systems. This is my tie to Wales. An interior carnage. Initially, I wrote 7 musical Sequences and experimented with them. Each was altered, cut up, broken, repeated in different octaves, turned upside down and backwards, then reassembled. For example, the Rain Sequence is developed out of a two bar phrase using an intuitive formula of increasing prime numbers, to presage the inexorable movement of the spoil heap. Over a week of heavy rainfall prior to the tragedy becomes the gradual dissolution of recognizable harmony, even as the number of pianos increases and one habituates to the erosion of sound. Specific choices respect the physical event: 7 (pianos, Sequences) refers to the number of the coal waste tip that collapsed; each Interlude contains 144 beats, one for each person killed. Through-composed, the music spirals — as did the actual collapse — periodically and unpredictably interrupted by Trauma, amalgamated portions of the Rock Sequence. During final revisions I had a miraculous dream I was certain pertained to Aberfan: the presentation would be as a film that could roll forward and backward, through and beyond. One could participate, could follow, could see the moment of death entering, when the soul was coming through, opening into eternity. Aberfan is participatory. An immersive space will be created using projection of imagery and semi-transparent scrims, capturing the landscape and people, the tactility of coal, ingrained in their faces. The viewer will move through the space, at times full of unsettling, discordant movement as if being subsumed in an avalanche of slag and at other times nearly silent, inducing pause. One can walk inside, behind and around the moving images, inside of the presentation. A psychological and spiritual rendering as much as a musical one, Aberfan is an excavation into my own soul, propelling itself through me — the story of power and destruction wrought over all the world in the willful, negligent and unconscious devastation upon those most vulnerable and the call to transform, through my music, the inscrutable events. visitation by a child. Through the sounds and images of Aberfan, where the boundary between what is divine and what is human is fluid, where time is anytime, and geographical distances absent, notating what I have seen and heard and felt is to resurrect, is to record for anyone else access to what has long been buried. We are living now the upheaval — the turning outside what was in, what has long been buried — and must live now to extricate ourselves from what would obliterate good, what is bright and free. The underbelly, black water out my dream now burst upon the land, no sorcerer could have done without people. We are in the confines of a trained evil. Aberfan is an elegy not only for the people of Aberfan who suffered the loss of a generation and the wounded soul of the Welsh who saw their beautiful country destroyed when the coal mines came to the valleys, but for our world, besieged by unbridled industry pillaging the land and exploiting its riches for the few. In this desperate time, it is urgent we activate moral and creative counterweights to intellectual arguments for climate change: awaken the spirit of shared humanity and responsibility that lives in each of us. Aberfan confronts and aims to disrupt our complacency, inciting change in the only way possible, speaking directly to what is at the heart of our survival as fully actualized beings on a thriving planet — the need to reconnect with our innermost being, where one lives in balance and reverence for the natural world. 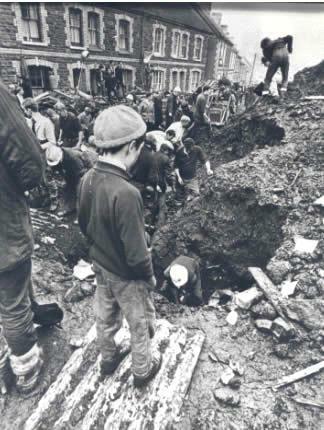 In bearing witness to the specific atrocity of Aberfan, we recover connection to the past and expose our present challenge. In sensing what is greater than ourselves, we re-envision a sustainable and just future. Aberfan is a sponsored project of New York Foundation for the Arts (NYFA), a 501(c)(3), tax-exempt organization. Contributions are tax deductible.